The Rocket 4D Synergy evaporator from Genevac is designed to provide a productive tool for automatic drying or concentration of very large volumes. Configured with a five-litre 316 stainless steel evaporation vessel,­ the system offers productive automated removal of solvent for labs running kilo-scale preparative chromatography equipment. Traditionally such labs have relied upon using several rotary evaporators to remove the large volumes of solvent from sample fractions. This time-consuming manual process requires a dedicated operator to top-up dry ice in cold traps, feed the systems with more product and watch the systems continually. 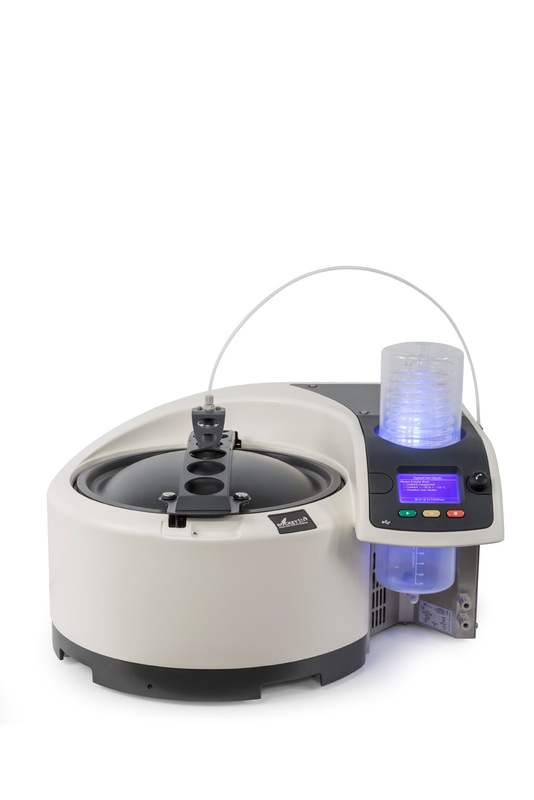 With a Rocket 4D Synergy evaporator users simply load their sample, select a method, press start, and walk away:­ the system will do the rest. Compact in size the Rocket 4D Synergy allows users to dry or concentrate their samples with complete confidence as it uses proprietary vacuum technology to suppress solvent bumping and foaming ­problems associated with sample loss when using large scale rotary evaporators. Users wishing to dry volumes larger than five litres require the Autofeed option, which enables the Rocket 4D Synergy to automatically draw in further chromatographic eluent ready for evaporation. The evaporator controls product feed, drying and the discharge of condensed waste solvent without any external intervention. The autofeed system has an integrated rinse circuit which enables dried products to be automatically re-dissolved in a small volume of solvent at the end of the process. Alternatively, the same circuit can be used under manual control for solvent exchange, by selecting a different solvent for re-dissolve. Cleaning the system between cycles is very straightforward. The PTFE feed tubing is easily detached for cleaning or replacement and the vessel can be readily cleaned, wiped, inspected and even put in a dishwasher. The Rocket 4D Synergy also includes powerful cold traps that maximise solvent recovery protecting the environment and improving drying of samples.